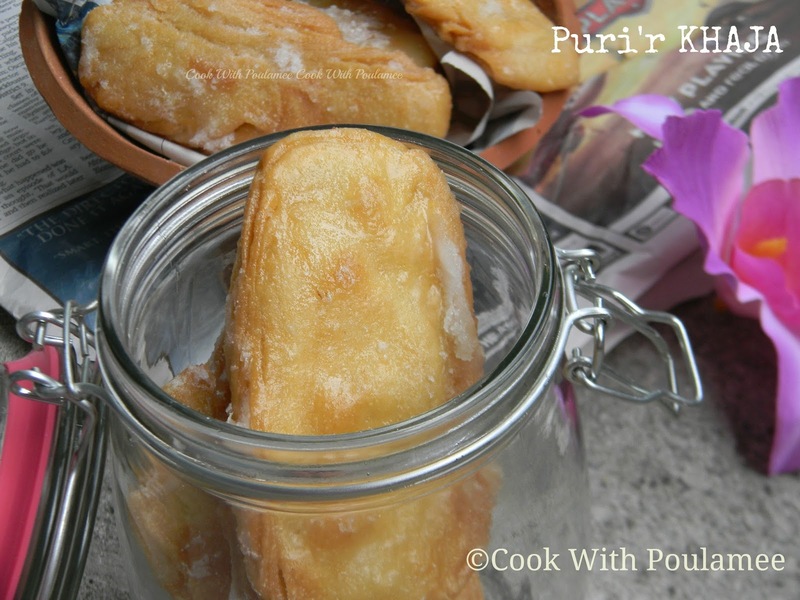 Cook With Poulamee: KHAJA: Puri Special. From today morning I felt like to have some sweets, because it’s being a long time I didn't prepare any sweet dish. But didn’t want to make some cottage cheese sweet. So I thought to make some Bhaja Misti. 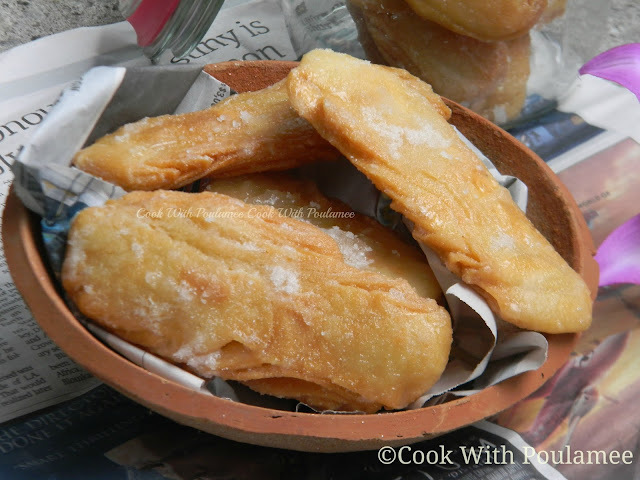 While entering the kitchen my husband asked me did you ever try KHAJA exactly like PURI BEACH (ORISSA). 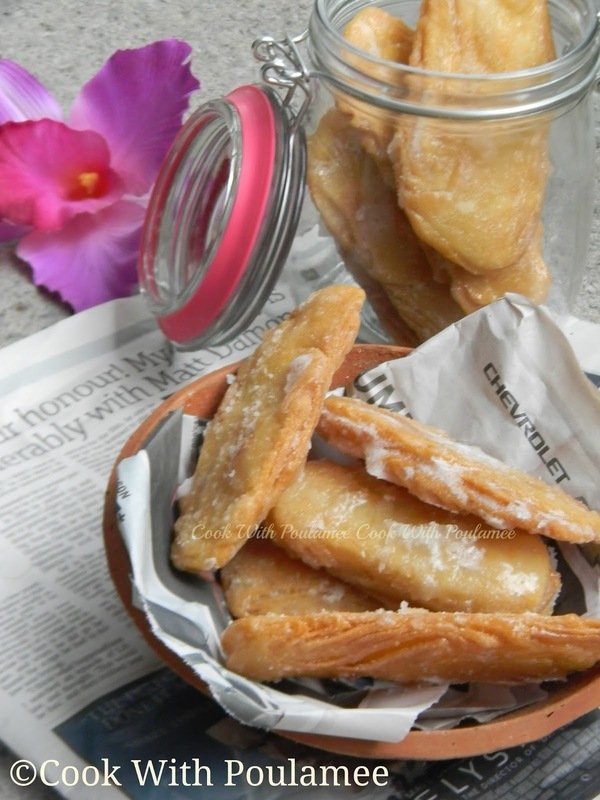 And I thought let’s give a try because KHAJA is one of my favorite sweets too. I went PURI 5 to 6 times and every time we ate as well as bought for home lots of KHAJA. And while making them I just went back to my childhood days. Previously I thought making KHAJA will be a very tough job, but it was not that tough at all. I never thought they will turn out that good. Recipe courtesy my grand maa but my Maa actually described me the full procedure over phone. Thanks is not the enough words for that. 2.Samolina or Suji: one table spoon. 3.Baking powder: one tea spoon. 8.Rice Flour: one table spoon. 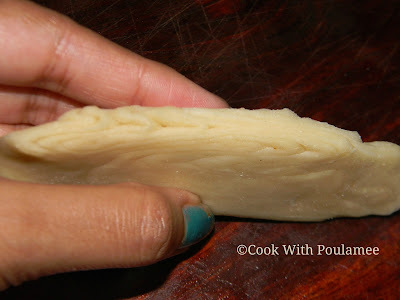 Take a big bowl and slowly add the flour, semolina, baking powder, salt and three table spoon ghee (for moyam), now make soft and shiny dough with some water. Now divide the flour dough into 4 equal size balls. 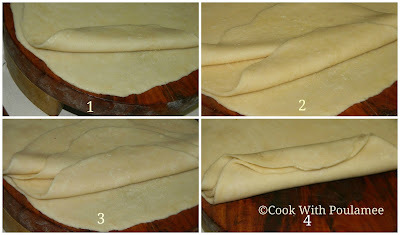 Now use a rolling pin and make four round shape roti with the flour dough and keep it aside. 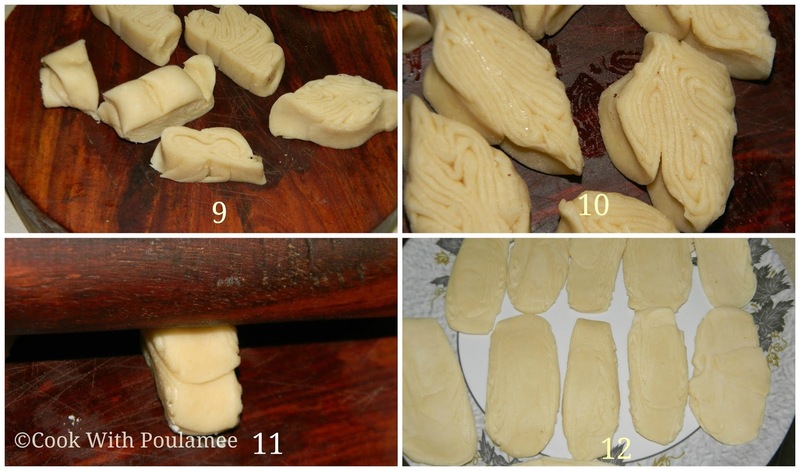 Now add one table spoon ghee and rice flour in a bowl and mix it well. Now place one roti first and spread some ghee and rice flour mixture on top, now place one more roti on top and spread the rice flour and ghee mixture on top this way place all four roti one after one. 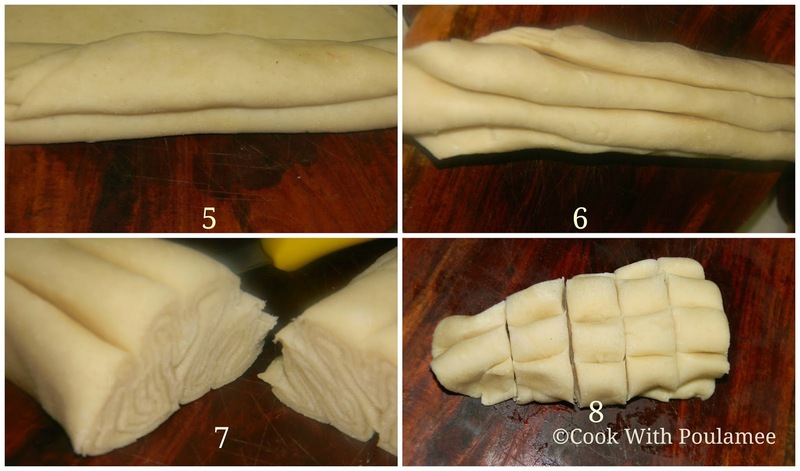 Now fold them together from one corner and fold it on the same side then flip it and do the same and repeat the same till it fold completely like the photo. Now with a knife cut it from the middle and from each side make some small pieces. Now take one piece and join the edges, and flat the pieces with a rolling pin. Repeat the same with all the pieces. Now deep fry the KHAJA’s till both the side turn golden, soak the extra oil in a paper towel. 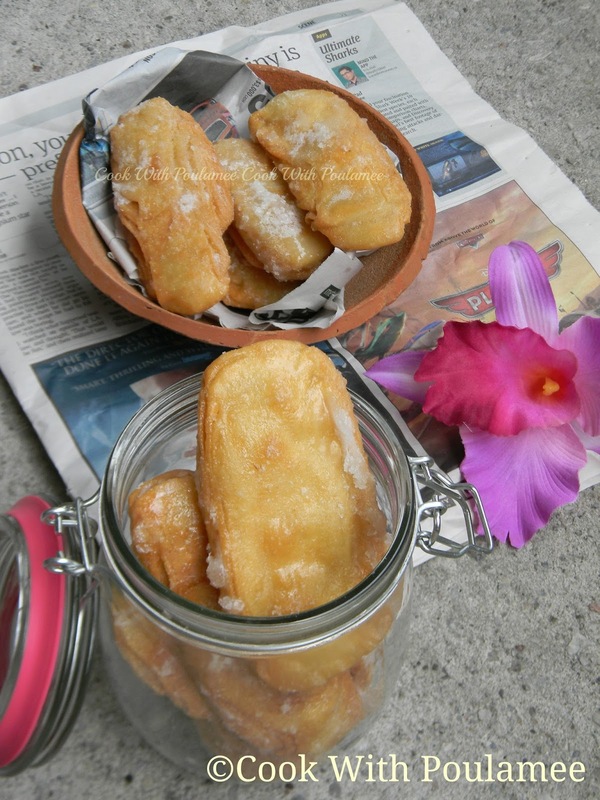 Now add 2 cup of water, 2 cup of sugar, few cardamom and make a thick sugar syrup. The syrup should be that thick like liquid gum. 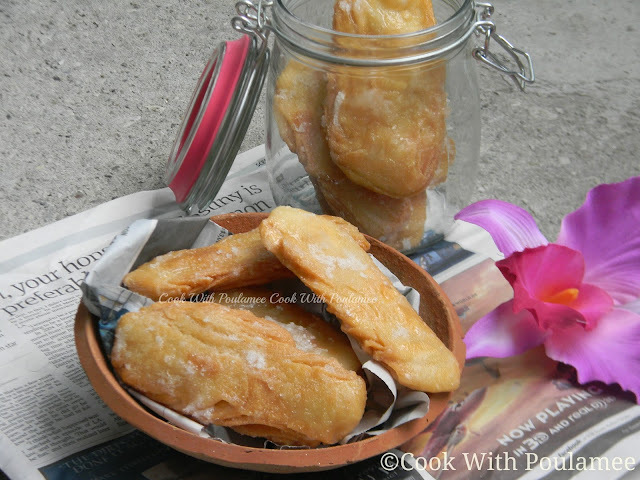 Now add the fried KHAJA’S into the sugar syrup and soak it for few mints. 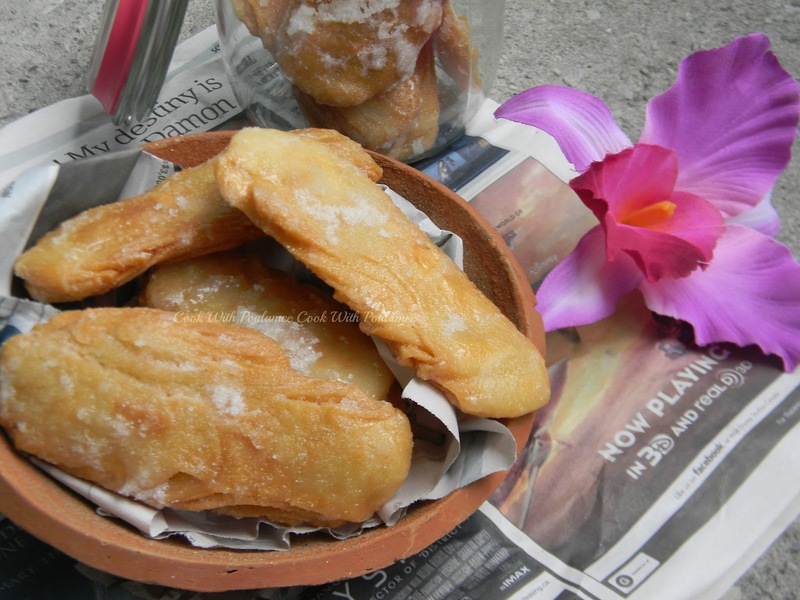 Now remove the KHAJA’S from the sugar syrup. Enjoy the KHAJA with your family member; my husband couldn't believe his eyes that actually I made this for him. Deeps satti go puri r oi prasad er taste i alada..thanx for visiting dear...r tomer comments pele darun lage. hey thank u Rimli...maa described the recipe over phone.. Thank u so much Ushnish Ghosh.